It's Brentford...Now who on earth would wish to live, die or drink there? ScummyTown personified, only beaten by it's sh**t'sville neighbour - Hounslow. I have lived in Brentford for twenty years and I decided last night that I will not go to my local anymore. 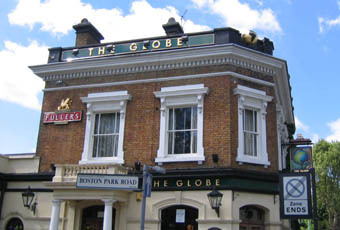 The Globe was great when Charlie ran it because he barred all the low life that now frequent it. The band were great last night( Replicator) but one felt that a fight was going to kick off any second - not a carefree safe atmosphere. In addition, the bar staff were rude. It has changed into geezerville! Not a bad pub, food is good value for money, always loads of fitties working behind the bar. Beer is okay not a fan of Fullers beers. Impressive Fullers pub in the shadow of the Chiswick Flyover. Had a couple of well-kept pints of the Chiswick Bitter. Sport showing on several TVs, food being served (check out the Rest of the World burger) and friendly and attentive staff. A great find.